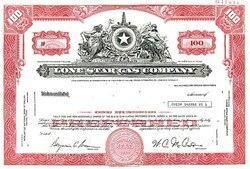 Beautifully engraved SPECIMEN stock certificate from the Lone Star Gas Company. 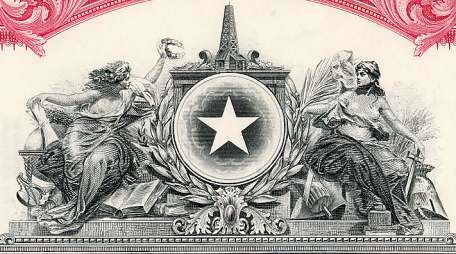 This historic document was printed by the Security Banknote Company and has an ornate border around it with a vignette of an oil derrick on top of a star inside a circle with an allegorical woman on each side. This item has the printed signatures of the Company's President and Treasurer. ENSERCH CORPORATION. Enserch Corporation, with headquarters in Dallas, is a diversified energy company with interests in petroleum exploration and production, oilfield services, engineering design and construction, and natural gas transmission and distribution. The firm was founded under the name Lone Star Gas in 1909 as a utility company to transmit natural gas to Dallas and East Texas. Partners George W. Crawford and M. C. Treat, with the help of attorney L. B. Denning of Ohio, established the enterprise in Dallas as a pipeline company allied with Corsicana Refining. At the time, Crawford and Treat owned a drilling company in Marshall, Texas, and operated successful gas wells in several states as well as the Petrolia field, which was Lone Star's major source for gas east of Dallas. The company's first president was Henry Clay Edrington, a former fiscal agent for the Agricultural and Mechanical College of Texas and organizer of the Traders National Bank in Fort Worth. By the end of 1909 Lone Star had begun the construction of what was then one of the world's longest pipelines, from Fort Worth-Dallas to Petrolia. The Petrolia field was not large enough to support the growing needs of Texas, however, so in 1916 Lone Star Gas expanded its business into southern Oklahoma. Between 1915 and 1924 the company confronted crises on three occasions when inability to deliver adequate gas supplies nearly forced it into receivership. In 1924 a technological breakthrough enabled the company to capture gas previously allowed to escape at the wellhead and revived the business. In 1927 Lone Star began to expand again with the purchase of the Dallas Gas Company, and by 1935 it had opened a new Dallas headquarters. In 1942 the company formed Lone Star Producing to develop oil and gas wells, and by 1968 it served a million customers through a network of pipelines across Texas and southern Oklahoma. In 1972, as part of the deep-well drilling projects in the Anadarko basin in southern Oklahoma, Lone Star Gas drilled a well 30,050 feet deep, the deepest ever completed at that time. The company changed its name to Enserch in 1975 to reflect the change in its business, which now included not only natural gas distribution and transmission but also exploration, resource recovery, and other aspects of the industry. Diversification began in the 1970s, when the Justice Department pressed the Halliburton Corporation, of Houston, to divest itself of its utility-construction subsidiary Ebasco; Enserch purchased the division in 1976. The subsidiary specialized in construction and construction management for large power-station projects, including the Encogen Power Plant in South Texas and the South Texas Nuclear Project. By 1989 Ebasco had constructed over 1,000 plants around the world and had worldwide annual revenues of $2.9 billion. The company further diversified with the acquisition of Losinger AG, a Swiss construction firm founded in 1917, which in the 1980s employed 5,000 workers building dams, bridges, and tunnels. The company's oilfield-service subsidiaries included the Pool Company of Houston, which employed 6,000 workers at oil-rig operations statewide; Oiltools, which provided oilfield equipment worldwide from headquarters in London; Samson Ocean Systems, acquired in 1978, a provider of rope systems that succeeded Samson Cordage, founded in Boston in 1888; and Alaska International Constructors and Frank Moolin and Associates, both acquired in 1982, which did construction primarily for the oil and gas industry. In 1981 the company established Enserch Engineering and Construction at Houston, and in 1983 it acquired Humphrey and Glasgow, Limited, an international engineering firm founded in 1892, which designed and constructed processing plants throughout Europe. In the 1990s Enserch entered into a partnership with Tejas Gas Corporation known as Gulf Coast Natural Gas and continued to grow. "ENSERCH CORPORATION." The Handbook of Texas Online. [Accessed Thu May 13 23:36:41 US/Central 2004 ].